I figured out that I'm kind of a fan of Austin Kleon's book, and I particularly like this assignment that we are supposed to post "artwork" that people at might understand better once they hear the story--the story of what it's about and why you made what you did. I think that art, in all its various forms, is exactly this--subliminal messaging of your own thoughts and emotions that you are attempting to convey to your audience. But I agree with Kleon's point--"Work doesn't speak for itself" and that "Pictures can say whatever we want them to say" (94). Does this make you think of the Mona Lisa? It's the most famous painting of all time, but honestly nobody really knows what's going on there. Who is she smiling at? Can we even call that smiling? I've personally seen the Mona Lisa myself, and I agree--it's weird. I think that most art is weird, and the weirder and more puzzling--the more of a reaction it gets. People don't like obvious--they like mystery, and in order to be successful in art, you want to make sure you leave your audience with something more--whether it be an emotion, an impression or a question--you want your art to speak for itself. And sometimes that message might get a little lost in translation, but that's what makes it so great. 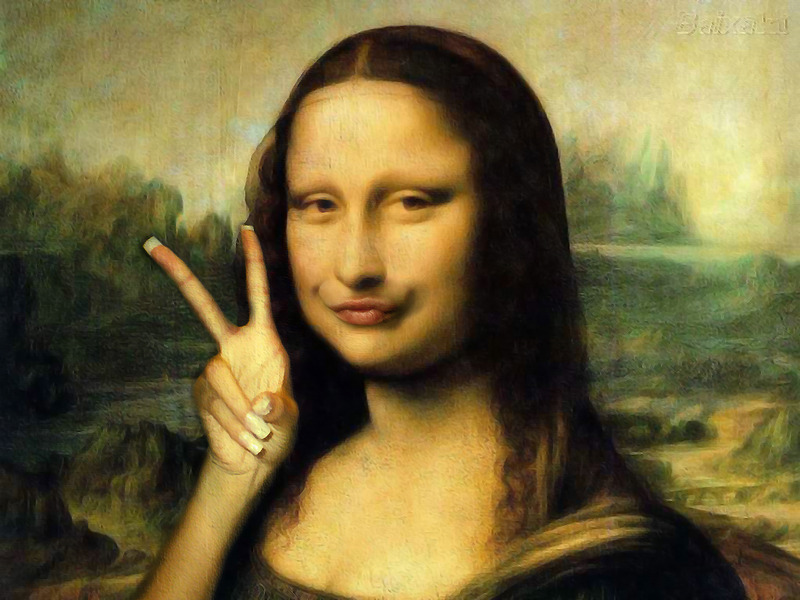 Personally if the Mona Lisa looked like this I don't think it would be as popular--or maybe it would be.....unfortunately. At first glance, you probably aren't sure what it is, but it's actually kind of a bird's eye view of me looking down from the upper-most balcony at all of the carpets. I was actually up really high, but it's an interesting perspective of my overall impression of the place. It was UNREAL. Soooo many carpets. And I did my best to portray that. But if someone else gets something else from this, then my work here is even more successful. 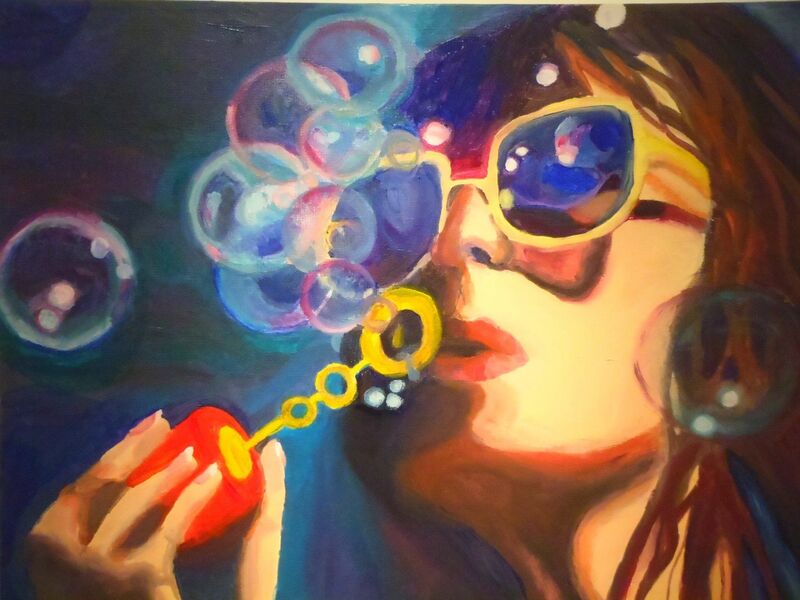 There really is no relevance to emotion or anything, I just thought it looked cool--this random girl blowing bubbles. But maybe someone will look at this and think differently? Who knows. I absolutely love your paintings, especially the last picture! It reminds me of Janis Joplin, so retro. 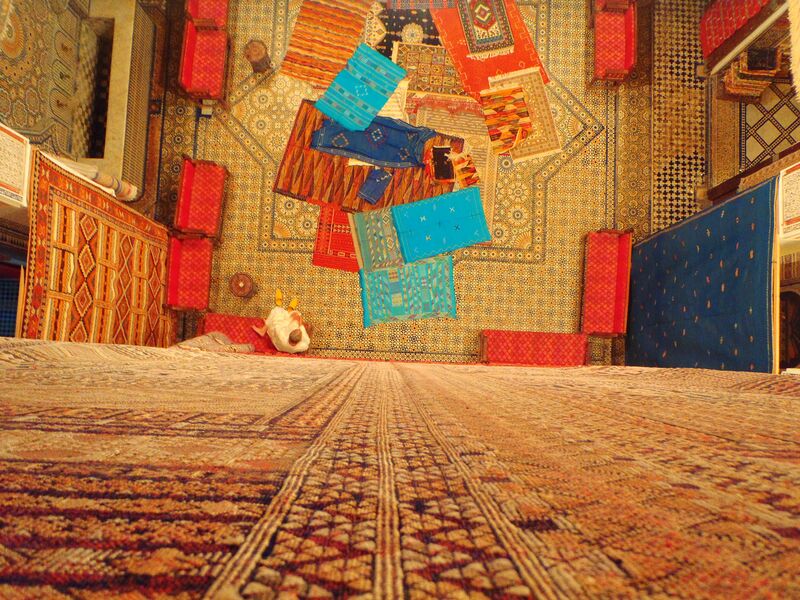 When I first saw your carpet photo I thought that the perspective was from the floor instead of a bird's eye view. I think the double take that the photo makes you do really adds to the experience of the work as a whole. The contrast of the bright blues and reds against the tan carpets draws your eye right to the center and gives you that ah ha moment once your eye makes its way across the page and down to the man sitting on the ground. That moment of not knowing exactly what your looking at or which way its oriented makes it interesting and once you make those connections you see the story come into focus. That photograph at the carpet store blew my mind. It was so simple but I was still so confused. It's amazing what kind of art you can make out of life. I also really loved your oil painting! Great Job! Your oil painting is really neat. I think a potential interpretation of it is to relax and let your worries blow away in a bubble. Haha, that's what I get from it anyways. Cool! Now that I think about it, the Mona Lisa smile looks like how I smiled before I had braces. I didn't like my teeth, but I didn't want to look goofy and smile too big, so it's hard to tell that I'm smiling in some pictures. The funny thing about the Mona Lisa is that we make it seem like such a grand work of art by the way we talk about it, but it's less than two feet tall. Why isn't the Wedding at Cana that big of a deal? The Mona Lisa was the first thing I thought of when I read these chapters in Austin Kleon's book. She's an anomaly. Your photograph of the carpet store totally tripped me out. If I hadn't read your description I would have initially just viewed it as if the camera was propped on the floor, not a birds-eye view. And your oil painting is so good! Thanks for sharing! I love the Mona Lisa picture. I love the Mona Lisa picture. Also you're oil painting is super cool! I don't understand why it took you so long to like this book. Were you not hooked on page one?